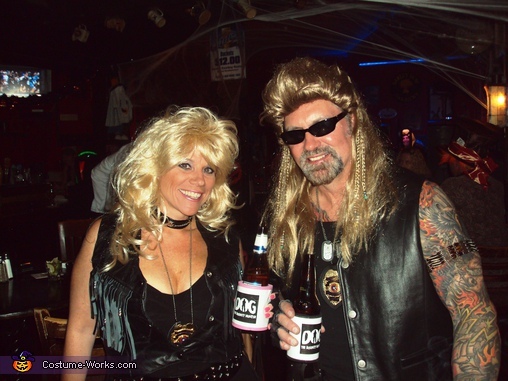 We decided to go as Dog & Beth for Halloween. Dog's wig was purchased from Amazon and Beth's came from a local, seasonal Halloween store. Leather vests were purchased on ebay. Dog wore jeans and Beth wore a black dress. We both wore boots. Beth's accessories (gun, handcuffs, etc) were purchased at the Dollar Store and spray painted pink. Dog's accessories are the "real thing" and not altered. I cut the finergs off a pair or Halloween gloves and hot glued rhinestones to the knuckles. Dog's gloves were purchased at an Army Supply store. The Koozie's were made using images printed off the internet. I also made "wanted" flyers using photos of my friends and arrested them. 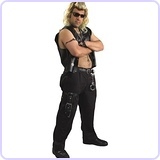 Very easy costume to make and a lot of fun to wear.